Download the Electronic Press Kit for Sacred America, Sacred World here. "The difference between a cockeyed optimist and a visionary is that one encourages us to sit back while the other inspires us to commit to a vision and take action. 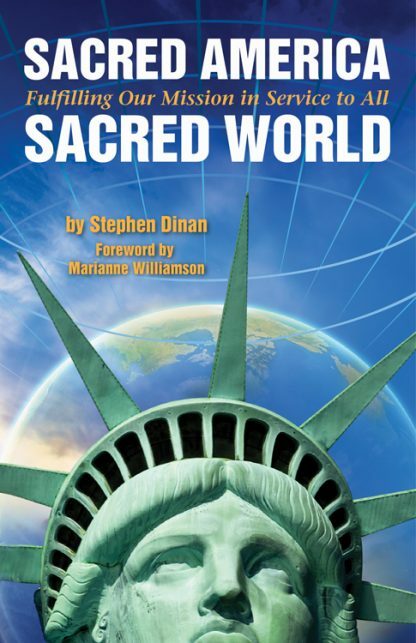 In Sacred America, Sacred World Stephen Dinan offers us a highly compelling blueprint to engage in deep and totally achievable global transformation. This is a visionary work of the highest order." �James O'Dea, author of The Conscious Activist, former President of the Institute of Noetic Sciences, former Director of Amnesty International, D.C.
Infused with visionary power, Sacred America, Sacred World is a manifesto for our country�s evolution that is both political and deeply spiritual. It offers profound hope that America can grow beyond our current challenges and manifest our noblest destiny, which the book shows is rooted in sacred principles that transcend left or right political views. Filled with practical ideas and innovative strategies honed from the author�s work with over 1000 luminaries via his company, The Shift Network, Sacred America, Sacred World rings with a can-do entrepreneurial spirit and explains how America can lead the world toward peace, sustainability, health, and prosperity. This vision of the future weaves the best of today�s emergent spirituality with seasoned political wisdom, demonstrating ways America can grow beyond its current stagnation and political gridlock to become a world leader in peace and progress. Published to coincide with the party conventions and presidential debates, this book will promote a return to the sacred principles cherished by America's forefathers in order to create a �transpartisan,� non-ideological, pragmatic approach to social reform. This uplifting discussion explores evolutions in political leadership, environmental concerns, and economic reformation. It is time to forge a bold new image of America�s future. Here is a road map for getting there. Stephen Dinan is the CEO of The Shift Network and a member of the prestigious Transformational Leadership Council and the Evolutionary Leaders group. As the former Director of Membership and Marketing at the Institute of Noetic Sciences, he was the driving force behind the Shift in Action program. He also directed and helped to create the Esalen Institute�s Center for Theory & Research, a think tank for leading scholars, researchers, and teachers to explore human potential frontiers.